Finally, I've got a bit of time to post St. George from a-England's The Legend collection! 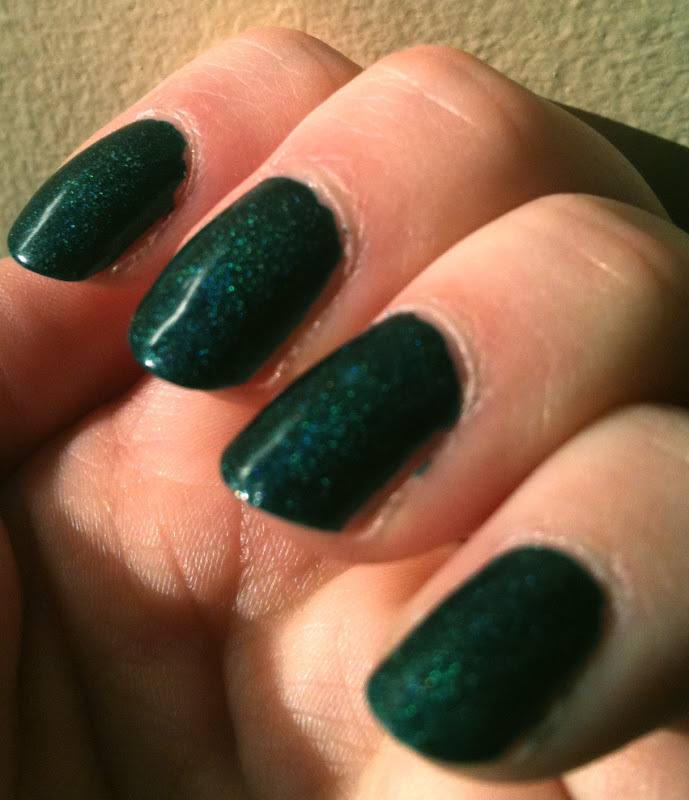 A bunch of pictures for this one as I was trying to capture the glory of this shade. Saint George is named for the knight who slayed the dragon and saved the princess. A-England describes this shade as: Bearer of a valiant and courageous heart, this fathomless teal reveals the strength of the brave knight's convictions with his gleaming, fiery core. I HAVE BEEN LOOKING FOR YOU ALL MY LIFE! Okay, maybe not that long but this is the most beautiful forest green nail polish! 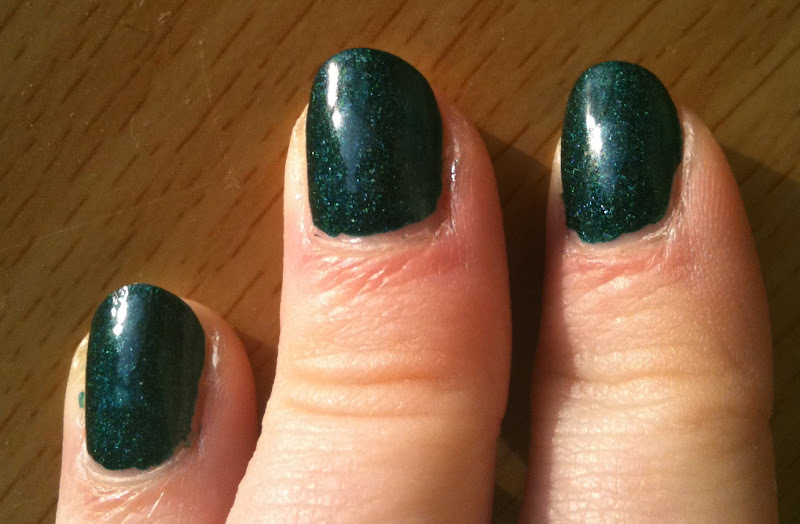 It doesn't look teal very often but instead a lovely rich blue-based green. Most of the time it looks like it has slightly lighter green shimmer throughout it which is really the holographic particles. In the sunlight the holographic bits come to life revealing mainly green blue and purple shimmers. 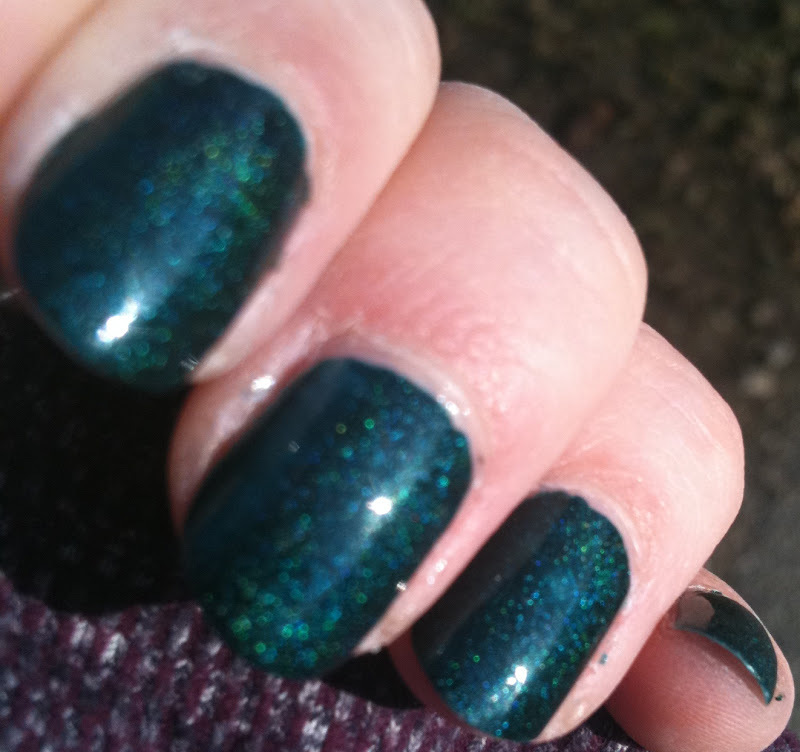 The holographic effect is very subtle (unlike how some of the other blogger's swatch shots have been showing where it's holo-crazy) but I do love it. The formula of this was good, not too thick or too thin. It wasn't too difficult to work with at all. You do need two coats of colour, possibly a third if you had some bald spots. St. George wore really well too with limited tip wear and hardly any chipping. Saint George can be purchased from the a-England website (Free international shipping), and from Illarowe online. It's 9 GBP (pounds) or $12 USD. 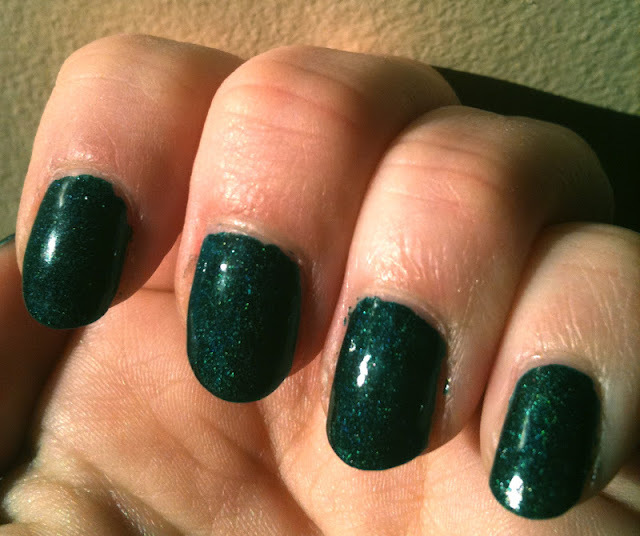 Overall, I am in love with this polish. 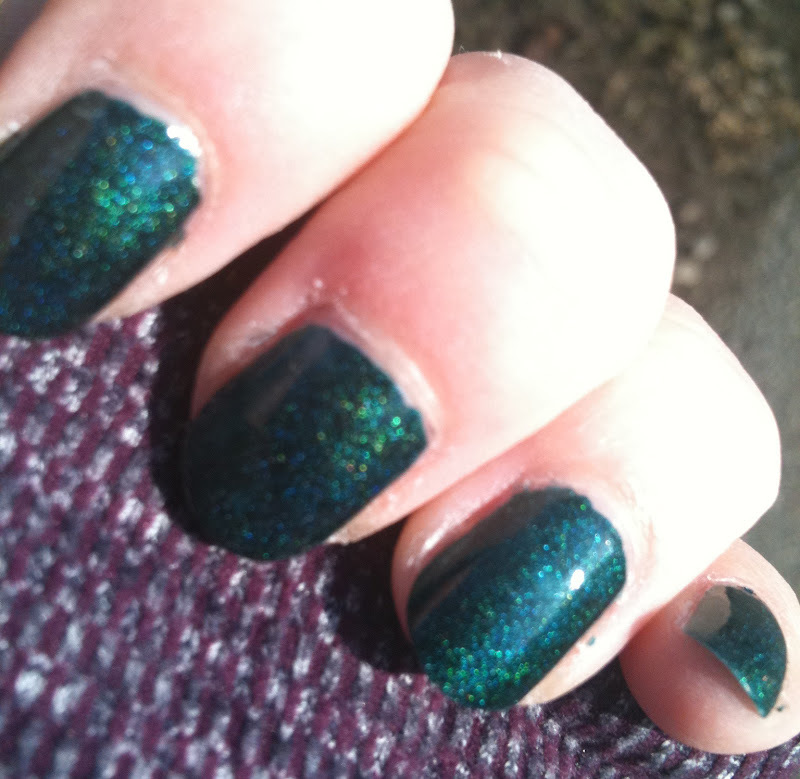 It's two of my favourites in one, dark blue-based green and holographic goodness. Add in that it shipped lightning quick, Adina the owner of a-England was a blessing to work with and the free international shipping and I'm blown away. Way above average wear time, a good formula and Big Three free as well as a cruelty-free company and this baby has it all. I've got nothing bad to say about this polish! Let me know what you think! What would you like to see Dragon (green with copper flash and holographic) or Ascalon (silver with purple flash and holographic) next? Wow! 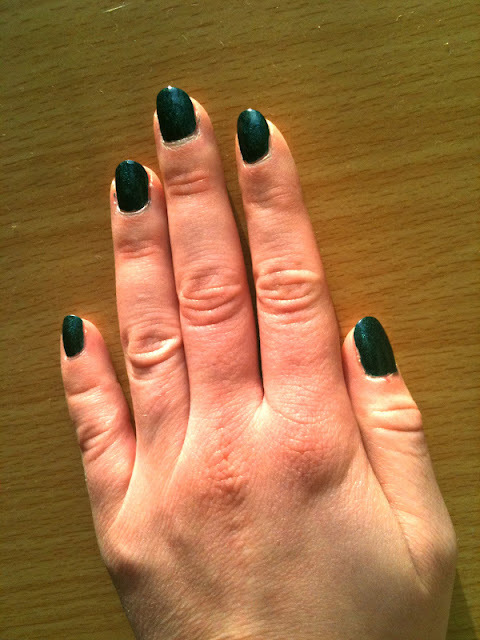 Such a great polish!